People have a tendency to "give up" easily, and they seem to have a hard time "letting go." The difference is really in their attitude. In some cases,” giving up” means quitting something. For example: "He gave up a project because it was too hard." or, "She gave up yoga because it was too time consuming." These types of giving up are negatively influenced. The persons don't feel they have to willpower or ability to overcome it. Rather than continue, they simply quit (give up). Sometimes, it is an act of some sort of sacrifice. For example: "He had to change careers due to his family situation." Or, "She had to move to a less-expensive town to better afford her children's needs." Letting go, on the other hand, can provide freedom for the individual. Letting go of anger, jealousy, and any other influence that can benefit ALL parties involved. Remember, that which you resist, will persist. Giving up is more suited to quitting something for a particular reason, whether you actually wanted to or not. Letting go relieves you and other of any further consequence or burden. If you are arguing with someone, and you just quit and walk away ... then you both suffer frustration. If you both choose to let go, then the entire event and its consequences will dissipate. Even if it is only you who lets go, you will be free of the burden and relieve yourself of the emotion or thing. Letting go shows good intentions for all who are involved. 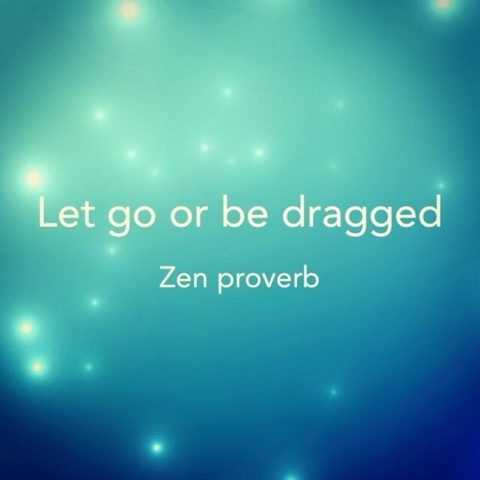 An old Zen Proverb says: "Let go, or be dragged."